Marco Arment wrote a post on his blog that makes me sad. I fail to see how consumers lose. The disconnect between the things he said on his podcast about patent trolls like Intellectual Ventures and Lodsys and this is just mind-boggling. In case you read this Marco it’s not personal, I don’t hate you, I don’t think you are stupid. I am just irritated and astonished that you manage to both hate patent trolls and now don’t understand the impact of the verdict in the Apple v. Samsung case. Let me try to explain. First of all – costs can’t be „passed along“. A customer ALWAYS has to pay for all the costs of production. Even the costs for licenses and every other fee and fine the company that produces a product has to endure. John Gruber and Horace Dediu keep updating us on how Android manufacturers don’t make profits anymore – except Samsung. The company just endured a 1 billion fine AND a 7.5 billion loss in all profits it made via selling the products that got ticked off as having infringed Apple’s patents. If you didn’t know that, please read Nilay Patel’s writeup. It tells you „What it means„. That’s a 8.5 billion fine. Samsung Electronics made „only“ 12.059 billion Dollars in profits in 2011. Meaning that with the fines they endured in this single lititgation, they lost 70% of all of their profits from ALL of their electronics manufacturing in 2011. That includes everything from TVs to refrigerators. I (!) fail to see how they should be able to offset this. I fail to understand how they should pass these costs along to their costomers. You can’t pass along costs that you endure after a sale. They already sold the phones. How are they supposed to get the money they now should get from anyone who bought a Samsung phone that infringes the Apple patents? Your argument here is that Android was already changed by Google so it doesn’t infringe these patens anymore. And that Apple only won the case because Samsong blatantly ripped them off, infringing the obvious, most general patents. But what does this mean? It means that Google needs to do things different, in other ways. That doesn’t help Samsung now, they already endured the costs. I know – shame on them for doing it in the first place, but how can you be certain that the Android that Google now produces doesn’t infringe patents anymore? How can you be safe from further litigation by Apple? How is this situation any different than what Lodsys did with small App publishers on the Appstore that infringed some icon and who now have to pay thousands of dollars in fines and hand over a large part of their profits to Lodsys in the future of every single App they sell on the App Store? How is Apple different here? There are other lawsuits pending around the world. Isn’t it possible that in the end Apple will get ALL of Samsungs profits for 2011? They won ONE case, how are we supposed to assume that they won’t win ALL cases around the world, including every case pending in Europe? In case they chose b) you said that they should just offset the costs. Like I said above, you can’t do that. As a customer, you ALWAYS have to pay for ALL costs of a product. Let me explain why. The most basic example is a company selling a product at cost. Before, Samsung sold a product that didn’t endure penalties. If they produce at cost, their phones would cost that amount less if it weren’t for the penalty/license fee. There is no way around that. A company can’t live on no profits (except if they subsidise the product with the goal of getting the money back somehow later on – maybe Twitter rings a bell here). If you think they could get the money back via cutting the salaries of their executives, by cutting the dividend etc. then you are wrong (sorry). They can’t do that. Because the product quality will suffer. Let’s just pretend that they have their own Phil Schiller, their own Jonathan Ive. Do you really think that because Samsung did something wrong their employees should take the hit? Most likely these employees won’t. Maybe it’s the employees further down the assembly line. If not, maybe Samsung will loose these great developers and design gurus (I’m sorry I can’t say that with a straight face, let me just add a sarcastic grin here) to other companies who will pay them the salaries they want. If they were able to cut costs in the past they already did. That’s what „doing business“ means. Maximizing profits mean they already offset every possible dime they could. They „passed along“ everything they could already. All license fees and fines have to be paid on top of that. It’s the most basic rule of economics. You can’t save more than you can save already, otherwise product quality will suffer or you lose sales. Anyway. If Samsung made the best product possible with the tools they had then they reached a price point where they were happy to sell their product at. They lowered the prices almost instantly every time they put a new phone on the market. The Samsung Galaxy Nexus hit the market last December at 650 Euro here in Germany. I bought mine in April for 450, selling my iPhone 4 on eBay for 400 Euro. I basically got a new phone for the price of a 1.5 year old Apple device. And today the Galaxy Nexus is at 350 Euro. Without a contract. That is almost half the price of an iPhone 4S to which it is comparable. 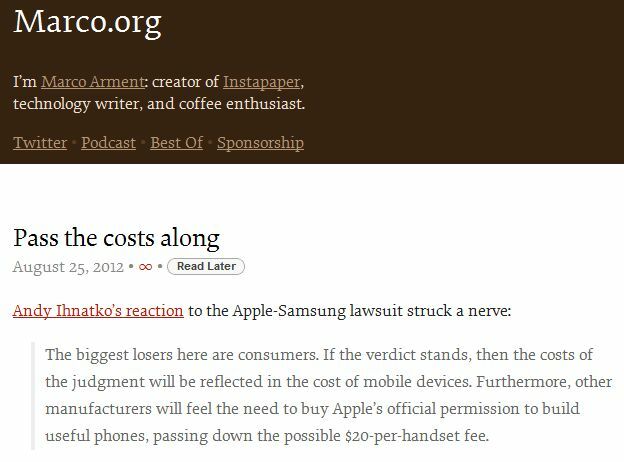 Marco, you can’t with a straight face say that Samsung should just save the costs of litigation and patent fees somewhere or pass them along. If you tack on these costs to the products, it is the customer who has to suffer. Because there are always customers who can’t afford a product at price X but at price X-1. That’s the law of large numbers for you. Supply and Demand can be converted into a simple graph and it’s not hard to understand that at a lower price point more customers are able to buy a product. You simply can’t say that customers won’t suffer because of the verdict. Because Samsung can’t pass the cost of the lawsuit along to past customers and they can’t make the price point they managed to hit before because now their cost of production is higher. Less people will be able to buy a Samsung phone because of this. And that means customers suffer. Not the ones who manage to still buy the phones but those who won’t be able to. Here’s another hyperbolic example: meds. If you know anything about the cost of healthcare then you know that those are high. Most of these costs come from patents on the meds. I bet you heard about AIDS or Malaria meds and how 20 cents a day could save a life in Africa. It’s 20 cents. It isn’t 20 cents and a bit. It isn’t 21 cents. It’s 20. And I guess you understand that those 20 cents are most likely the cost of production. That there’s no way to save more money because if these meds are saving lives and are about 50 times cheaper than what they cost in the US you know that the companies who produce those meds already cut costs to the lowest possible price point. Those people in Africa don’t have more money. And the companies that produce pill(s) for 20 cents a day won’t be able to cut costs anywhere anymore. Now tack on just a cent on those 20 cents because of litigation and make it 21 cents. Simple math tells you that for every 20 people who get their meds, one won’t, because those 20 cents are needed to pay for that one cent per pill that got tacked onto the price. I know this example is silly, but maybe it transports the idea of „suffering“ Andy Ihnatko tried to convey. Customers will „suffer“ because Samsung phones just got more expensive. I know they will only suffer from not getting their newest gadget half a year earlier. But let’s just transport the idea of cheap meds to the iPhone. Horace Dediu keeps telling us that Apple could defy the law of large numbers by aquiring new markets with earlier generation phones like the iPhone 3GS. Markets like India or China or even Africa. All those markets are also markets for a Samsung phone. If right now a Galaxy Nexus costs half of what a iPhone 4S costs, basically sporting the same features, it’s clear that more customers around the world right now are able to get a latest generation Smartphone. In some countries this would be the person’s first computer. Maybe their only computer for the next decade. Maybe the computer, and let me take that idea from Nicholas Negroponte and his „one laptop per child“ initiative, that will bring those countries closer to the living standards of the first world. Something that helps these people pick themselves up by their own bootstraps. Something that improves their quality of life, that educates them. Because the rectangles with round corners that Apple brought us are devices that could change the world. And Samsung basically chose to produce a „generic“ version of that device. A smartphone only needs maybe 12 Watt/hours a day to operate, an amount of power that could easily be accumulated via a small solar panel or a hand crank. Those 12 W/hs are not even close to what’s needed to power an OLPC. The display alone consumes 1 Watt per hour and both you and I know that you can operate any Smartphone including the iPhone forever when the 1000mW charger that comes in the box is powering it. Customers ARE suffering because of that lawsuit Apple just won. They suffer around the world.